If you look up the word unstoppable in the dictionary you are likely to find a photo of a smiling Selly underneath it. Whoever said dynamite comes in small packages was clearly talking about the young Ghanaian. Today she proudly inhaled the sweet smell of victory during Rubies Power of No Task. Today’s challenge was more about lady luck than anything else. 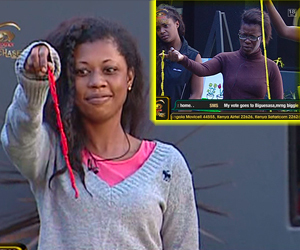 The Housemates had to pull out one piece of string out of a bowl and hold them up for Biggie to see and the Housemate lucky enough to pick the shortest string was announced the winner. The two-time Ruby Head of House continued her winning streak and now has the power to pick one Housemate to sit out the Head the House Task. When it comes to making HoH decisions, Selly is always full of surprises it’s anybody’s guess who she will pick. Over in the Diamond House it was Fatima who beat out the rest of the competition and now the petite Malawian also has been bestowed with the Power of No. Who will Fatima use her power against? Only time will tell. Selly may choose d strong ones dat can fight her frm winning again n I guess Angelo!Then Fatima may chose Bev or Bolt or even melvin cos I don't trust her wishperin n sleepin together wt Hakeem.all d same is only God dat Saves throu Africa! Munya was up every week n African's took him to d finale. God hav destined d Winner b4 d show started.